For the past few years I’ve participated in NaPoWriMo (National Poetry Writing Month), writing and posting a poem every day (or almost every day) for the entire month of April. This year I just couldn’t do it. Hence poetry guilt. But today is a beautiful spring day here in the Bay Area, and I need to remember that poetry will come again. Besides, when has guilt ever done any good? Instead why not offer up this poem for spring. If you had told me when I started this blog in 2011 that it would lead me to writing nonfiction, I would have scoffed. But that’s exactly what happened. I’m honored to have my essay published in their latest issue. You can read it it online here: Snowsuit Prisoners. ...when you completely forget that you've had a poem accepted for an anthology, which, when it comes in the mail, is quite beautiful, thick and juicy with poetry. And you find your poem amongst works by such luminaries as W.S. Merwin and Jo Harjo and Denise Levertov and Lucille Clifton and Evie Shockley (who I met at AROHO), just to name a few. And the overturned truck on the freeway that lengthened your morning commute by almost an hour and the school room that is your "office" with no heat and the hard conversation you had to have with a colleague fall away as you bask in the glow. 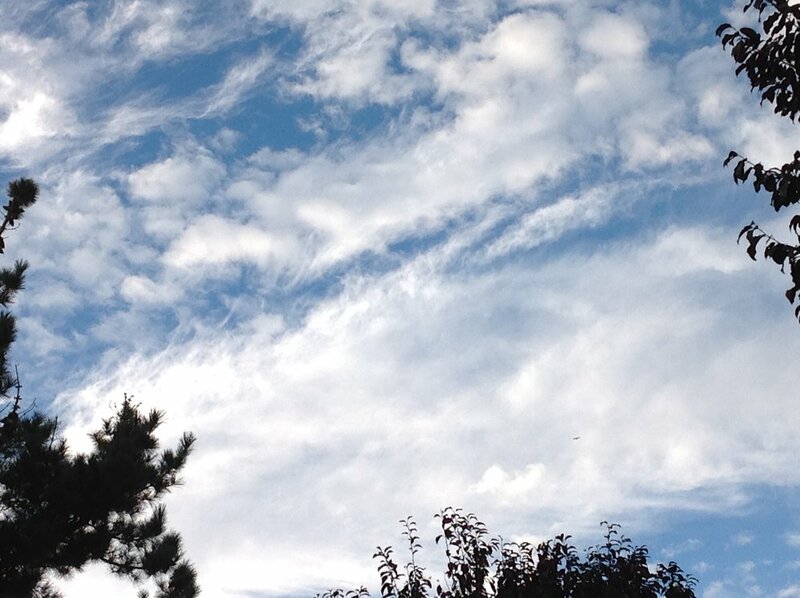 across the deep blue sky. I wish for a gun. Lisbon is a beautiful city filled with many blue-tiled buildings. It was the perfect place for a new Always a Blue House video. Check it out here. 2017 was a year of highs and lows for me in many ways. On the up side there was the Always a Blue House reading tour. Riding high from publishing my poetry collection with Saddle Road Press, run by the incomparable Ruth Thompson and Don Mitchell, I had a wonderful time with my writer-sisters Tania Pryputniewicz, Michelle Wing, Marcia Meier and Barbara Rockman who arranged readings, planned poetry workshops and opened their homes for poetry salons. Without them, I would never have been able to pull off such a tour. I can never thank these friends enough. Then there was the saddest event of the year: my father's death on October 11, 2017. Having spent the last three years mourning the gradual decline of his mental capabilities, my feeling of loss has been a muted grief. I am thankful that Dad didn't linger in dementia limbo. Even at the end, he was able to enjoy visits from family and friends. He still knew we were his people even if he couldn't always remember our names. With all the tumult of 2017, when 2018 rolled around a few days ago I felt particularly reflective. However, before I got around to making a list of new goals, I read an interesting article in The New York Times: The Only Way to Keep Your Resolutions by David DeSteno, a professor of psychology at Northeastern University. In it DeSteno claims that "By Jan. 8, some 25 percent of resolutions have fallen by the wayside. And by the time the year ends, fewer than 10 percent have been fully kept." Why do we fail so miserably when trying to keep our resolutions? According to DeSteno it's because of "our tendency to be shortsighted - to value the pleasures of the present more than the satisfactions of the future." And this is all because of the way we look at willpower as the key to success. The very idea of willpower goes against our own evolutionary path as human beings. Focusing on what DeSteno calls self-focused goals was not what mattered most to humans for most of our history. Instead, what led to our success was "strong social bonds." So just what advice does DeSteno give to help us achieve our goals? Here's where I found the article most interesting. The author claims that we are ignoring the very tool that will help our success. What is that tool? "It's our emotions - specifically, gratitude, compassion and an authentic sense of pride (not hubris) - that push us to behave in ways that show self-control ." How intriguing. This idea made me look at one of the biggest resolutions I've ever made: starting a daily writing practice. When I think about what has helped me get up early every morning to write (since August 19, 2013, 1601 days and counting), certainly genuine pride in creating this achievement helps keep me going. That is simple. But what about gratitude? What part could this emotion play in helping bolster my resolve? Even though I am not naturally an early riser, the impact of my morning practice has been immense. I have never felt more like a writer in my life. And without this, Always a Blue House might not have been born. And for that I am grateful. I know I'm grateful to my writer friends for their support. I know that giving similar support to them them can only enrich my life and help me become a better "literary citizen." (See Ten Kind Suggestions for Being a Literary Citizen post on Women Who Submit blog). I try very hard to be that kind of friend and colleague. I've just never named it as compassion before. DeSteno's article gave me a new way of looking at setting resolutions. When contemplating a new goal, I'll try to remember to find not just the reason for that goal but the feeling that drives me. I'm hoping that will help me stick to what I set out to do. As for the new year, now I'm struggling to find a reason to be grateful for going on a post-holiday diet. I'd welcome any suggestions for how to feel that! Land falls away to sea. What is it about this coast that is so potent? Somehow standing on the precipice looking outward makes me more aware of what I want, what I need to be. National Poetry Month has been over for almost a month. Just to remind you that there can poetry everyday, here's another poem for Hawaii. The prompt for that day: write a poem that reflects on the nature of being in the middle of something. The poem could be about being on a journey and stopping for a break, or the gap between something half-done and all-done. under rain misting your hair. water stretches in every direction. you the center, betwixt and between. north and south, east and west. The challenge for Day 13 was to write a ghazal. A ghazal A ghazal is formed of couplets, each of which is its own complete statement. Both lined of the first couplet end with the same phrase or end-word, and that end-word is also repeated at the end of each couplet. Under leafy rain frogs shrilled til dawn. Sky lightened as it does each dawn. across the wall. Now he’s gone. Dawn. with bird song. Two roosters crow, Dawn. scrape of metal shaking sleep before dawn. all rustle the story of far-away dawn. even paper I try to fill with this dawn. Last weekend I took Always a Blue House on the road for the first time, going to San Diego for the Not Yet Dead Poets Society First Friday reading with my dear friend and sister poet, Tania Pryputniewicz. Tania and I then co-led a Saturday morning poetry workshop at San Diego Writer's Ink. 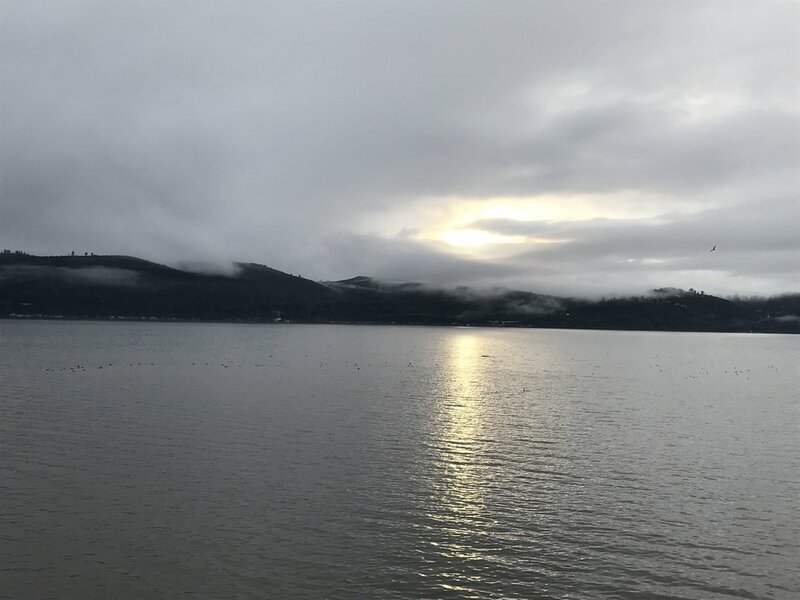 One of the writing prompts Tania brought to the workshop was based on a poem she wrote about another time we spent as poets together at a writing retreat in Calistoga, CA. That poem was the first in what has become an ongoing poetry challenge that we've tossed back and forth to each other. Sometimes it takes months for us to complete our poems. In fact, I'm working on one right now. Until I finish that poem for Tania, I thought I'd re-post the first challenge poem that appeared on this blog back in June 2015. It seems like a good way to thank my friend for her love and poetry support. In Difficult Animal (Saddle Road Press), Lisa Lutwyche shows us the meat and bones of life, that difficult animal we all struggle with, full of love and confusion, with hidden teeth. This collection is a poetic memoir beginning with her childhood: talented parents, music they produced, and her young ache for love and acceptance. However, just when I began to believe this would be the story of a girl and her family, I was brought up short. This is no idyllic reverie; Lutwyche doesn’t shy away from life’s pain. The lessons of her grandmothers whose presence is a soft constant in the “Great-Grandmother Annetta” and “Gentle Watch,” are shattered by the violent death of a fawn whose eyes wouldn’t close. This poem, “Requiem for a Nuisance” brings ominous undertones of danger. Dance and shout she does. Lutwyche uses multiple points of view in her poems as if she holds life in her hands, turning it over and over to view it from every angle. Images of hands appear repeatedly throughout this book: a father’s whose hands held the power to move hearts, violent hands of an abusive husband and a new love whose touch / heals. But the most important hands are those of this brave poet, wielding her pen. In “Brewing the Witch” She stirs in the deep secret / of her untapped strength…brews the witch / she needs to be. And this reader is glad she did. On January 1, 2014, a brave group of writers began their journey, vowing to write one haiku a day for a year and sharing them in an online group, The Haiku Room. I was fortunate to be among that group of 33 poets. Now you can read a selection of our haiku in the anthology, Everyday Haiku available from Wandering Muse Press. After over five years of posting on Blogspot, Poet Teacher Seeks Home has a new home. I'm excited to announce that my blog will now be housed on my main website. This means that those of you who have supported me by subscribing to my blog will need to re-enter your email if you want to continue receiving posts. And I sure hope you will keep reading. 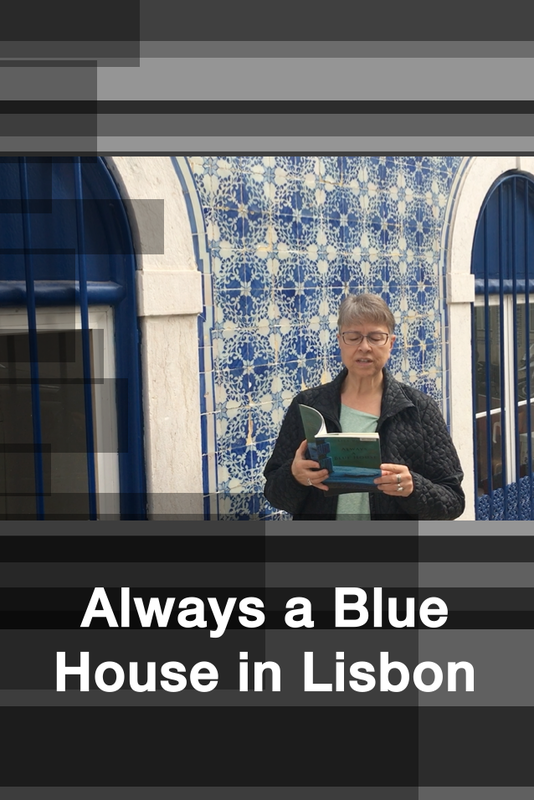 Another new feature to check out is my Always a Blue House On the Road video tour. As part of my book launch tour, I've decided to make a video of me reading a poem in every place I visit this year. Check out the first one here.